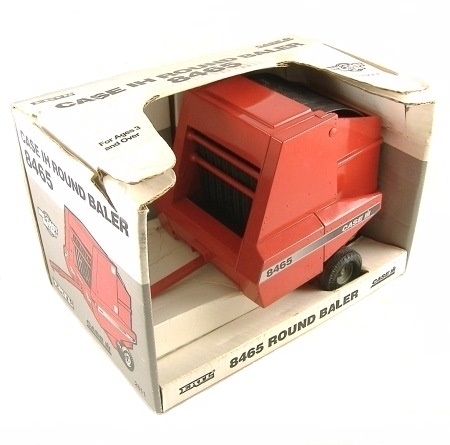 This substantial diecast model is in red with a black 'rubber' belt. 'Case8465' labels on the sides in black and silver. Wheels are black plastic with grey hubs. The rear opens to reveal a large round plastic hay bale. This model is in excellent condition with just a few paint rubs on the corners. The original box is complete and in reasonably good condition. Just the thing if you have a 1:16 scale tractor that needs something to pull! Because of its size and weight this item may be sent by a special courier service for non-UK destinations., and may take longer than usual to arrive.